Ware Spirituality Type Indicator - EpiscoWhat? 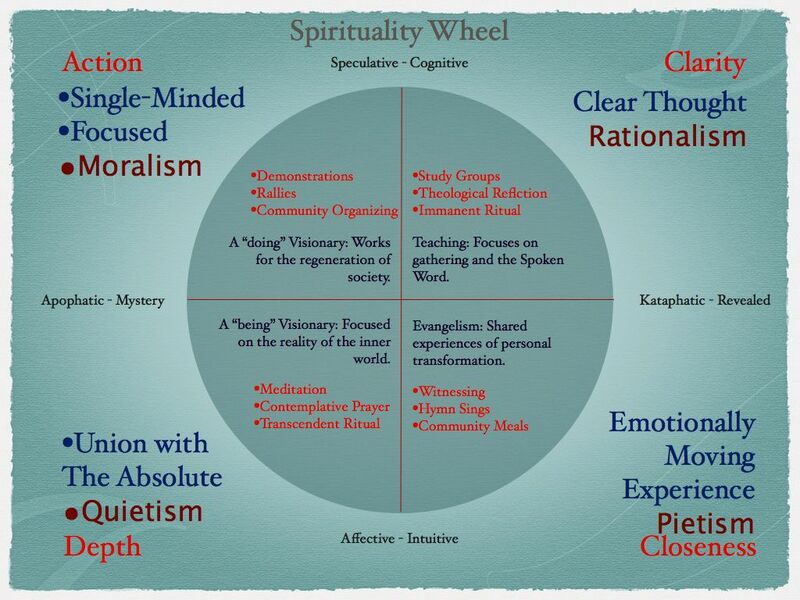 This spirituality type indicator is similar to personality tests such as Myers-Briggs. It works with two continuums (Head & Heart and Knowledge & Mystery) to give you a general idea of how you experience God. It is drawn from "Discover your Spiritual Type" by Corrine Ware. The book contains in-depth discussions of the types and resources for group leaders to use this indicator. The Ware inventory is 12 questions. An online version of the inventory is embedded below. You can go to the stand-alone version on ProProfs here. General descriptions of the spiritual types are found below the inventory. This axis poses the question of how one goes about knowing. Is it through the mind or through feeling? "Apophatic" means "Negative." It means that a person or discipline thinks of God in noncretized ways. "Kataphatic" means "Affirmative." It is the method of thinking of God most familiar to Western Culture, that is, revealed and knowable. Adapted from "What is your Spiritual Type" from the Disciples of Christ. These folks focus on the importance of the written word and sound doctrine. Predominance in this quadrant is demonstrated in a love of order and a desire for things to be logical and consistent. You have probably found your high spiritual moments in hearing something said that stirred you to a moment of understanding or in reading a passage that seemed to say exactly what you felt to be true. If the written word has power for you, go with your strength and set out on a very intentional reading program or intentionally seek out speakers who can make interesting and congruent presentations. The growing edge for Type l is the more mystic experience of those in quadrant 3. Here the head/intellectual faculty must suspend itself and practice a sort of waiting before God. The object is to quietly enjoy God and to be in God's presence as an end in itself. Thomas Merton said, "The language of God is silence.” Find a time and place to be in silence for silence can indeed tune the heart. The strength of Type 2 is in the richness of feeling. Their great gift is their ability to experience God in the moment. But they need to remember that God has not departed just because one moment is not as high as a previous moment. Since so much of Type 2 spirituality is affected by circumstance, - the here and now moment - they will want to see that they are fed by the experiences that promote their feelings of connection to God. Seek out places where a warm and informal worship style is used, where the music lifts you. Growing toward your opposite quadrant might be very beneficial, once you accept as God-given your own spiritual strengths as well as those of others. Your opposite, Type 4 is the visionary who thinks critically. You might feel challenged to put some of your enthusiasm to work on behalf of a social cause that will beneﬁt many people. Try volunteering or social activism. Type 3 often are considered the “questers” because these people seem to be perpetually on a journey. ln fact, journey is one of their favorite words. They never reach the destination, of course, but it is the journey that matters. For this type, “being" is more important than "doing," because the doing will pass away. The great gift of Type 3 is the ability to move past the temporal, past what is physically seen and heard, and to engage in a "deeper sort of knowing." When you meet a type 3, whose spirituality is well developed, you may feel as if you are at the eye of the storm where all is calm within the chaos. Type 3 believes there is a reality that transcends what can be named and measured. To grow, a Type 3 needs inner silence in which to make a closer connection with God. The Desert Fathers and Mothers did not move to the desert primarily to punish or deprive themselves, but to live without distraction so that they could more fully focus their attention on God. If this is where you ﬁnd your predominant tendency, my guess is that you are drawn to techniques of meditation and contemplation. Feed yourself with time alone, with poetry and meditation, with wordless prayer and with the enjoyment of nature, art and literature, and all the other things that move you to consider God with gladness. Without some balance, Type 3 might retreat from life in a way that is too reclusive. Again the growing edge is the opposite quadrant. Type l can teach Type 3 to ask, "Does this make sense?” and “ls this realistic and logical?” The thinking and touching Type l can give Type 3 a "beneficial reality check" and grounding. Type 4 is probably the least represented in the general population, certainly within worshipping congregations. Often the roots of their social concerns come out of the church in which they grew up. They sometimes leave congregations because they become impatient with the perceived lack of concern. By promoting their visions and insisting that others join in, they can be disruptive to settled-in congregations. lf your predominant tendency is in the Type 4 quadrant, try to ﬁnd a hospitable, likeminded community that shares your vision. lt doesn't have to be large. lt might be Habitat for Humanity folks, or people who meet and organize a CROP walk. When you feel great intensity about a certain cause, you need the support of others to keep you from burning out or becoming bitter. You may be tempted to become so involved with your cause or project that you neglect the interior reflection that means so much to you. See to it that you attend as much to the inner life as to the outer life. One will nourish the other. ln your impatient moments, you may be intensely irritated with the quadrants to each side of you. ln your eyes, Type l may talk a good game but not accomplish anything; Type 3 has its head in the clouds and is good for little. This analysis might be true, but do not fail to notice that each spirituality type has its own gifts-and you are the recipient of some of those gifts. world as well as in that future for which you hope. The world needs you badly, take care of yourself and nourish your spirituality that so effectively demonstrates itself in effecting societal change.